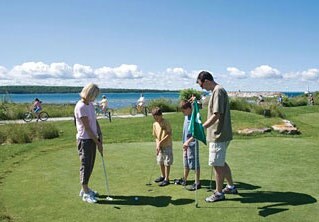 The Greens of Mackinac is our 18 hole putting course. Located alongside Bistro on The Greens, this course offers a truly unique putting experience with 18 real bent grass greens that rivals conditions of any championship course! The fun and laid back atmosphere allows guests to visit the bar at Bistro on The Greens and carry their beverages with them during their round. The balls glow… the flags glow… the tees glow… the cups glow… and even golfers glow! Glow Golf is a must for visitors of Mackinac Island! Every player is given a glowing necklace and plenty of light up toys and accessories are available for purchase. Bistro on The Greens will even serve up come glowing beverages (alcoholic and nonalcoholic of course) for your round!